I think this photo is too cute. That is so cute. I love the pj's everyone is wearing. Is your sisters name really Buffy, lucky! LOVE....Love your page!!! It's fun to see what you are up to, and see pictures of everyone. You do know that you are my favorite!!!! 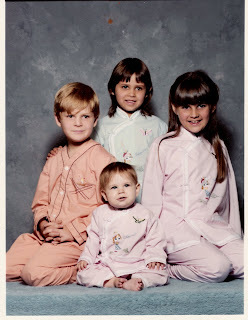 Who's the really cute one in the mint green pjs?